Bordering Brandenburg to the south, the Mecklenburg Lake District sits to the center and south of Mecklenburg-Western Pomerania. Surrounding its capital of Neubrandenburg, this region is famed for its Müritz National Park, countless of lakes and swamps, and the expansive wildlife. The town of Waren (Müritz) is quite hilly, but it sits on the edge of Lake Müritz, the second largest body of water in Germany after Lake Constance. Nearby is the similarly large Kölpinsee, as are huge tracts of agricultural land and small forests — and to the west is the Naturpark Nossentiner-Schwinzer-Heide. The whole of the Mecklenburg Lake District is perfect for the outdoor adventurer. Whether you want to fill your days with water-sports at one of the dozen or so locations, or you want a trip to the Müritzeum Visiter Center to check out the wildlife, there is plenty to keep you occupied. The 13th century Stargard castle in Burg Stargard sits on one of the few hill-tops in the region overlooking the capital town of Neubrandenburg. This architectural gem is filled with Baroque beauty around every corner. There was a splendid palace here too, but it was destroyed by fire — fortunately its ornate landscaped gardens still survive for you to visit. 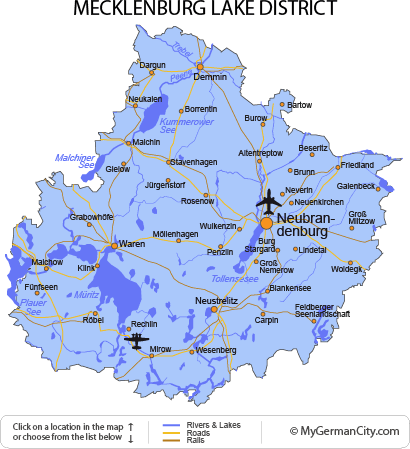 The northern part of the Mecklenburg Lake District and Demmin were very important in Hanseatic times, and were ruled by the Slavs. Based on rural affairs, it became a great stronghold and the ruins of its town wall and entrance towers attest to this. Royalty from Russia frequented this area, including Peter the Great. Dargun is the other larger town in the area, and is in the Peene valley surrounded by some large recreational lakes. The Klosterruine (Monastery Ruin) open air concert here is one of the 100 or so venues of the huge annual summer Mecklenburg-Vorpommern music festival. All the locations chosen for concerts are unusual and include St Peters Church in Altentreptrow and many castles and town halls nearby.